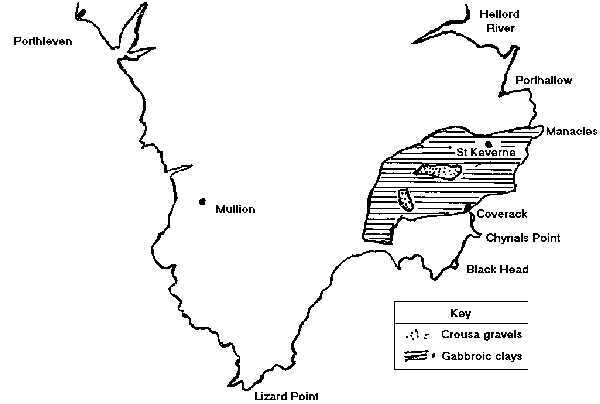 The use of Gabbroic clay from the Parish of St. Keverne on the Lizard Peninsula by Prehistoric people. Much has been written over the years about the uniqueness of the geology of the Lizard Peninsula but it is only comparatively recently in the archaeological record that this uniqueness has been applied to the lives of the people in Cornwall in prehistory. The question of the source of the clay from which most of the pottery found on the archaeological sites in Cornwall and a number in Devon and Wiltshire was first hypothesized by Dr. H. Thomas of the Royal Geological Museum in 1932, when he thinned sectioned sherds from Henbury in East Devon. He suggested that the clay used for the pottery from the site could have derived from the Dartmoor granite masses. It was not, however, until Dr. D. Peacock of Southampton University when he examined numerous sherds from Cornwall in the late 1960's, came to the conclusion that they were all made from the same source of clay. A type which was found at St. Keverne on the Lizard Peninsula. This clay covers an area of approximately 7 square miles and lies mostly at a varying depth of eight to eighteen inches below modern plough surface. The main composition of these clays are Felspars, olivines and augites. It is the white Felspars in the fired fabric of the pottery which gives the sherds the highly diagnostic feature, when it is retrieved from archaeological sites or in the course of field walking. Experiments with the various methods of firing from the bonfires of prehistory at 900º C to modern kiln firing at 1,400º C have shown that it is in the lower temperatures of the bonfires that the Felspar crystals do not melt out, and so can be seen in pieces of pot as old as 4,000 years. Whilst in the higher temperatures the Felspars are melted and absorbed into the fabric. Most of the pottery in archaeological sites in Cornwall has been found to be of gabrroic clay. For example at the hill fort of Carn Brea at Redruth it was found that a very high percentage of the 550 pieces of pot recorded were of gabbroic fabric. The great debate since Dr. Peacock's work has been; was the raw clay exported out from St. Keverne or were the pots made in the immediate vicinity of the clay? With the hope of resolving this question a group of members of the Cornwall Archaeological Society spent time in the late 1970's and early 1980's walking ploughed fields hoping to find a mass of wasters, i.e. broken pottery, which would have indicated a firing site. Though gabbroic sherds were found on many of the fields walked, there was never enough to indicate pottery processing. Why did early people in Cornwall find this clay so eminently suitable for this use? Might it have been the accessibility of such a vast amount of clay or maybe it was the Felspar forming a grog which helped in the successful firing of pots in low temperatures? Experiments in firing, using the raw clay with only the largest pieces of grits removed, have fired successfully in a bonfire. Washing and sieving of the clay produced a material suitable to be turned on a wheel. Or maybe it was trade, "I'll exchange two pots for a goat or a sack of corn". Who knows? However, there cannot be any debate for whatever reason, great quantities of the clay were used for the production of their pots by those living from 3,000 B.C. to 400 A.D. in the area that was one day to become the Parish of St. Keverne. A. BOWL - CARN BREA - Neolithic 3,500 B.C. B. URN - KYNANCE - Bronze Age 2,500 B.C. C. BOWL - THREEMILESTONE - Iron Age 500 B.C.